It’s a sobering thought but I suspect if I hadn’t started AIP when I did, I wouldn’t be alive today. A stroke, heart attack, liver failure, seizure and, sadly, suicide were all very much possible outcomes of this disease. However, despite my neurologists’ belief that gluten is the cause of my illness, I believe, now more than ever, that there is a second major factor behind what happened to me, coupled with a whole host of smaller factors in this sickly jigsaw. That second factor in my illness is perhaps the most common food consumed by humans today: sugar. Before I describe why I believe sugar is the behind my mental illness let me talk about psychosis for a moment. Psychotic illness is a symptom, not a disease and is more common than you may realise, with around 3% of people experiencing psychosis at some point in their lives. You are also 40% more likely to become psychotic if you have an autoimmune disease , and yes, there is certainly a strong positive correlation between major psychotic illnesses and celiac disease. Recent research has also shown that you can have an autoimmune reaction to gluten in the brain and not have gut symptoms and that at least 9% of psychotic illness is confirmed autoimmune , although no one has ever researched gluten antibodies causing autoimmune encephalitis, something which desperately needs to be done. However, gluten alone is not the only factor in psychosis, as researchers such as Prof Fasano continue to remind us. Researchers believe there to be an organic (biological) cause as well as a lifestyle factor. Lifestyle factors range from childhood trauma to the month you were born in (winter born people are more likely to develop schizophrenia, and this is true in both hemispheres). Experiments on patients in locked wards and on autistic kids have shown improvements when following a gluten free / dairy free diet, yet a full recovery like mine has never been recorded anywhere in the literature that I can find. There is also a well-known association between celiac and other autoimmunity and some think that prolonged exposure to gluten in a person with sensitivity may be the trigger for the development of other autoimmune diseases. So, what’s going on? Why do I think gluten and sugar is a factor behind psychotic illness? Well first a quick neuroscience lesson. The part of the brain that now appears to be at the root of my illness and that of many other people is the cerebellum. 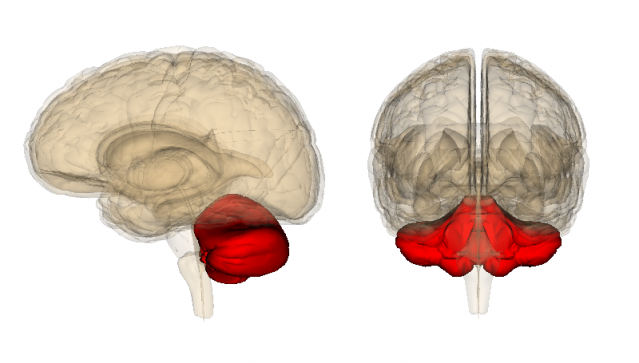 The cerebellum is only 10 percent of brain volume but holds over 50 percent of the brain’s total neurons and for years scientists believed it was only responsible for motor control, but it is now believed to be far more important and central to human intelligence. Studies have shown changes in the cerebellum in people with a variety of disorders, from autism to bipolar and schizophrenia and a movement disorder called ataxia, and it’s the link between these psychiatric illnesses and movement disorders that’s so interesting. Within the structure of the cerebellum are the Purkinje cells, neurons responsible for fine-tuned motor control, balance, and communicating information from the cerebellum to the cerebral cortex. It’s the last point, the communicating of information to the cerebral cortex that’s key here as its this understanding that has allowed scientists to move beyond the notion that cerebellar function was just about movement and coordination and instead has a role in emotion, memory, belief, cognition and pretty much everything else the brain does. Hadjivassiliou has proven that antibodies to gluten affect the functioning of the Purkinje cells in the cerebellum leading to ataxia and he has told me he believes these same antibodies are a factor in psychotic illnesses but as I mentioned earlier, scientists believe that there are other factors in psychotic illnesses, not just gluten. Perhaps these gluten antibodies are affecting Purkinje cells associated with other brain functions? I’ve not found any research exploring this, but I now strongly suspect it to be true. Have you ever gone on a drastic weight loss diet only to find that not only did you lose weight but also found your mental health greatly improved? If not head over to a few keto weight loss forums and ask for some stories from people who have experienced this, there are quite a few of them. It is my belief that these weight loss diets inadvertently remove gluten (and perhaps other foods), which is responsible for setting up the autoimmune reaction in the brain, and drastically reduce the brain glucose levels at the same time. This isn’t new thinking either, it was the subject of study over 50 years ago, and recent research has highlighted that many patients with psychoses have abnormal glucose metabolism, and Alzheimer's is known to be linked to an impaired glucose metabolism in the brain. What’s also understaood is that psychosis is due to over production of dopamine, in fact, too much dopamine can cause myriad mental health issues from hallucinations, ADHD, hyper-sexuality, euphoria and many others. And research has shown that glucose consumption triggers the release of dopamine and then impairs dopamine binding in the brain, although this is only shown in rats and much more research is needed in the area. However, there has never been any research that tries to link an underlying gluten or autoimmune reaction in the cerebellum to hyperglycaemia in the brain, nor how this affects the production, transport and binding of dopamine which may ultimately lead to psychosis. However I believe that there is enough anecdotal evidence to merit research into this possible link. What I think needs exploring is what gluten or other environmental factors may be doing to the permeable membrane around the brain, a protective barrier known as the meninges or blood brain barrier (BBB). 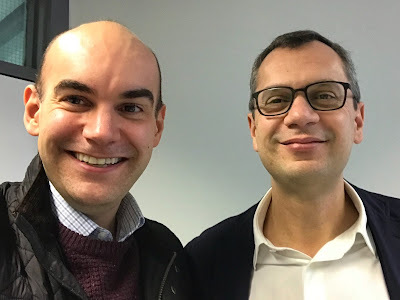 Fasano has proven that gluten affects the permeability of the tight junctions in the epithelium of the gut and allows excess permeability of macro molecules. This is due to the over-activation of a substance called zonulin, the physiologic modulator of the tight junctions. These macro molecules of food peptides cause an immune system response and in susceptible people these antibodies can become auto-antibodies, directed and the body’s own tissues, including the brain. What has been theorised is that the BBB can also be made excessively permeable by the same mechanism. It’s already known that BBB disruption is a marker in MS, it’s not unreasonable to believe changes to the BBB are behind other illnesses. It’s also well understood that the permeability of the BBB can affect the amount of glucose transported into the brain, for example when someone starves the BBB actually becomes more permeable and allows more glucose into the brain but doesn’t allow the glucose back into the blood. So could gluten be allowing excess glucose into the brain? It’s certainly worth exploring. I’m genetically susceptible to autoimmunity from birth and this, along with adverse life experiences predispose me to psychotic illness. 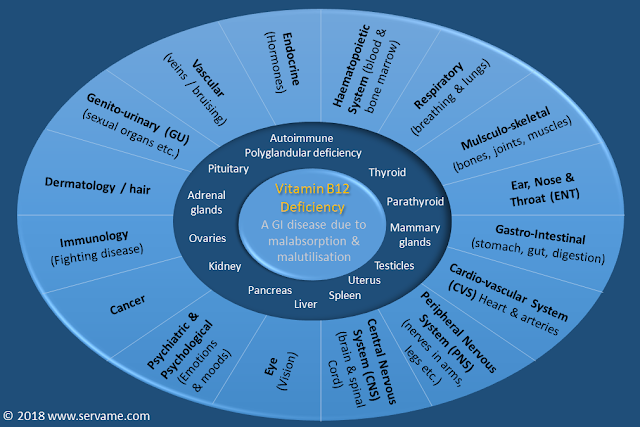 Gluten consumption caused an autoimmune reaction in my brain, resulting in mild cognitive impairment (brain fog), migraine and clumsiness, and also established hyper-permeability of the gut and blood brain barrier through activation of zonulin. The excess permeability of the BBB led to increased glucose (hyperglycaemia) in my brain, typical in people who follow high sugar diets (most of us), which in turn leads to excess dopamine production exacerbating the symptoms from gluten antibodies and leading to psychosis and other high dopaminergic symptoms. It’s possible that macro molecules to other foods permeated from my leaky gut and setup an autoimmune reaction which, if an anti-neuronal antibody was produced, can cause further encephalidites that worsen my psychiatric disorder. Lastly an unhealthy diet led to dysbiosis, the production of a neurotoxin called LPS and impaired metabolism of neurotransmitters resulting in reduced plasticity and poor recovery outcomes. Add to that B12 deficiency and an over- then under-active thyroid and you have the perfect mental health storm. 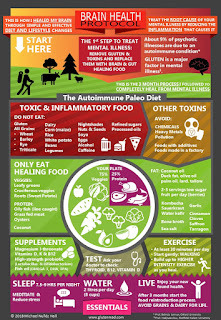 This would explain why I recovered so quickly by following AIP as the diet addressed every one of the factors above. It of course removed gluten to an extreme that no other diet would have, but it also stabilised my blood glucose levels and removed any other food stuff that may be causing my immune system to react. AIP is allowing the excess permeability of the membranes in my gut and brain to repair, which I’ve accepted may never fully happen, and by eating a nutrient dense whole food diet I am giving my battered brain the nutrients it needs to heal. I’m going to finish with some anecdotal evidence. In my case, every time I had an episode it was preceded by a period of dieting, a diet that not always completely removed gluten, but always cut carbohydrate (sugar) intake drastically. I always felt better when dieting, but never completely well. Whenever I broke a diet and ate a standard western diet, I developed symptoms including mania, depression, confusion, paranoia, hallucinations and migraine among many others. I was labelled with Bipolar 1. When I followed the celiac diet, a diet that’s high in sugar and processed food, I would become hypomanic, irritable, euphoric, impulsive and would have mild hallucinations. This is because I believe my BBB was still permeable and I had far too much glucose and dopamine in my brain (and maybe other antibodies to other food peptides), however I wouldn’t develop the full range of symptoms I experienced when also eating gluten. I never got well enough to really notice a link between diet and food. When I would go low carb I would still eat gluten in small amounts so I would never fully eliminate all my symptoms, because the gluten antibodies still persisted for 12 months after cutting gluten. People I’ve spoken with who had gluten ataxia say it took them as long as 18 months gluten free to really improve so I’m not surprised I didn’t get better going gluten free alone, I didn’t do it for long enough, and probably didn’t exclude gluten to the very strict degree that I needed to. Following AIP, removing gluten, other inflammatory foods, getting good nutrition and stabilising my blood sugar fixed everything in days. The best science is repeatable, and I tested this for a few days when I recently experimented with moving onto the celiac diet and found my mood destabilised, I couldn’t concentrate, I became mildly euphoric and had some strange thoughts. When I was then accidentally glutened all hell broke loose. I’m still recovering and won’t be trying that again! Many people will think treating mental illness with diet is controversial, and many subscribe to the belief that mental illness is forever, meds are the solution and you just must accept it. If you’re one of those I challenge you to make me liar!